Left with too much cranberry sauce after Thanksgiving? Here are some delicious ways to help your family use it up! I love Thanksgiving. There really isn’t anything better than spending the day with your family cooking and enjoying your favorite foods. When we decided to switch to a whole food lifestyle eliminating processed foods I was quick to find a way to include all my holiday favorites in a new way. My mom has always been a great cook and never relied on processed foods but the one thing that always appeared on our Thanksgiving table was the dreaded jelly canned cranberry sauce. My dad loves the stuff but I knew there had to be something better. Step 2: In a large bowl stir together dry ingredients (flour, salt, baking powder, cinnamon). Step 3: Make a well in the middle. Pour in the eggs, honey, vanilla, oil, orange juice & orange zest. Step 4: Stir together until just mixed (don’t over-mix). Then stir in cranberry sauce. Step 5: Line muffin pan with liners & fill each ¾ full of batter. Step 6: Bake for 10-15 minutes or until a toothpick inserted into the center comes out clean. Step 7: Remove from oven and serve warm or cooled. Adding ½ cup of chopped pecans would add a nice “crunch” to these muffins. Use your judgment on the amount of orange juice needed. If your cranberry sauce is pretty loose cut back on the juice some, if it’s on the chunky side add a bit more. You can substitute other oils for the coconut oil. You can substitute whole wheat flour (I like King Arthurs’ white whole wheat) for the spelt. Just watch the texture, if the dough looks a bit dry add some more orange juice. Using a juice squeezer makes juicing an orange a breeze! Using a small ice cream scoop helps fill the muffin tin quickly & evenly. I love mine topped with a pat of grass-fed butter! This is a quick and simple salad dressing that I love to make after the holiday. I like to pair this dressing with mixed greens with blue cheese and pears. But why not throw some leftover turkey in your salad with some chopped walnuts!?! Place all the ingredients in a jar, shake well & serve. Store in the refrigerator. As a condiment on your sandwiches. I like it just as is but mixing with a bit of mayo would be great as well. Or try stirring it into your favorite chicken salad recipe to add flavor to it. Top pancakes, waffles or French toast with your sauce. If it’s a bit too thick you can add water, fresh squeezed orange juice or a bit of 100% real maple syrup to loosen it up. How about a jam on my favorite pumpkin bread? Stir into some cooked oatmeal. Top grilled pork, chicken, lamb or your favorite fish with sauce. Top your favorite ice cream with some sauce for a bit of tang to your dessert. Mix with some goat or cream cheese. Spread mixture on crackers for a snack or quick appetizer. Use in your favorite cheesecake recipe and/or top your cheesecake with the sauce. If you just need a break from cranberry sauce but still have leftovers, freeze them in small containers for future use in recipes or as a side dish. Do you make your own cranberry sauce? 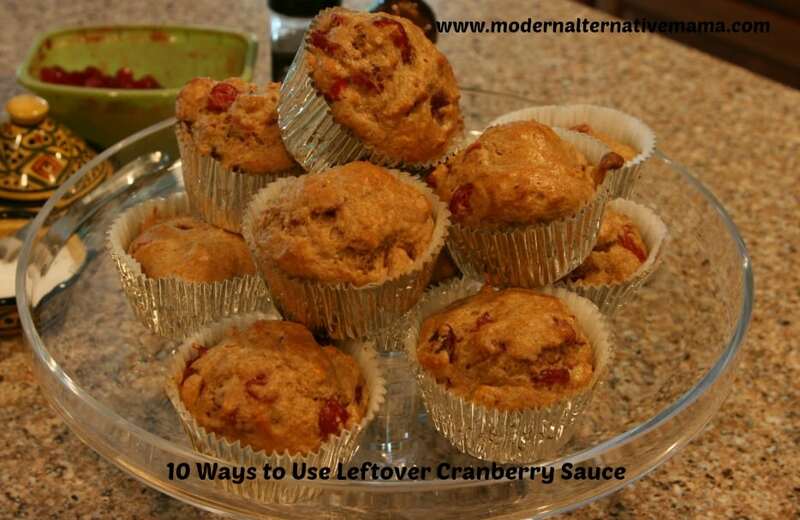 What is your favorite way to use up leftover cranberry sauce? While my wife was working I decided to play in the kitchen. We eat gluten and dairy free most of the time because our 5 year old son had some issues. We had a bunched of jellied cranberry sauce so I decided to use it up. Just made the muffin recipe with grapefruit instead of orange. Keeping my fingers crossed. Just removed from the oven and smells awesome!